Margaret ROUTH was born in 1783/1785 in Aysgarth and was christened on 16 Jan 1785 in Aysgarth. She died on 19 Nov 1869 and was buried in St Andrew's, Aysgarth [B300]. Margaret married Marmaduke DURHAM, son of Unknown and Elizabeth DURHAM, on 12 Jan 1808 in Aysgarth. Marmaduke was born in 1786/1787 in Aysgarth and was christened 25 Dec 1797 aged 11 in Aysgarth, Yorkshire, England. He died on 11 Oct 1877 and was buried on 13 Oct 1877 in St Andrew's, Aysgarth [B300]. William DURHAM was christened on 1/4 Nov 1810 in Aysgarth, Yorkshire, England. He died in 1840 in Aysgarth and was buried on 3 Apr 1840 in Aysgarth. William married Ann TILEY on 2 Jul 1832 in Aysgarth. Ann was born in 1814 in Thoralby. She died in Mar 1884 in Aysgarth and was buried on 29 Mar 1884 in Aysgarth. John DURHAM was christened on 24/26 Jan 1813 in Aysgarth, Yorkshire, England. John married Mary BAYNES on 31 Jul 1828 in Aysgarth. George DURHAM was christened on 7 May 1815 in Aysgarth, Yorkshire, England. 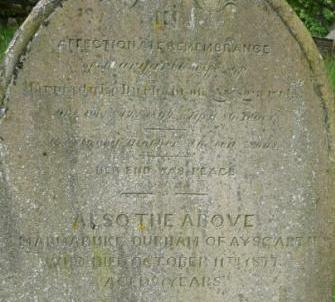 He died in Jan 1842 in Aysgarth and was buried on 29 Jan 1842 in Aysgarth. James DURHAM was born in 1817 and was christened on 3/5 Apr 1817 in Aysgarth, Yorkshire, England. He died on 6 Oct 1899 in Aysgarth and was buried on 10 Oct 1899. James married (1) Elizabeth before 1851. Elizabeth was born about 1823 in Darlington. She died on 11 Dec 1863 in Whessoe St, Darlington and was buried on 11 Dec 1863 in West Cemetery, Darlington. James also married (2) Sarah Ann GLEW on 25 Oct 1865 in Congregational Church, Union St, Darlington. Sarah was born about 1821 in Leeds. She died on 22 Jun 1888 in Bondgate, Darlington and was buried on 24 Jun 1888 in West Cemetery, Darlington. James also married (3) Sarah Frances SIDDLE on 23 Dec 1890 in Congregational Church, Union St, Darlington. Sarah was born about 1846 in Holbeck, Leeds, YKS. Christopher DURHAM was born in 1819 in Aysgarth and was christened on 28 Feb 1819 in Aysgarth, Yorkshire, England. He died in Aug 1902 in Aysgarth and was buried on 12 Aug 1902 in Aysgarth. Christopher married Jane SANDHAM, daughter of William SANDHAM, on 12 Mar 1845 in Aysgarth. Jane was born about 1804/1805 in Middleton Braw, Lancs. She died in Jan 1877 in Aysgarth and was buried on 11 Jan 1877 in Aysgarth. Septimus DURHAM was christened on 24 Jun 1821 in Aysgarth, Yorkshire, England. Octavus DURHAM was christened 06 Jul or Jul 1823 in Aysgarth, Yorkshire, England. Nonus DURHAM was born in 1824/1825 in Aysgarth and was christened on 16 Jan 1825 in Aysgarth, Yorkshire, England. He died on 5 Jan 1909 in Aysgarth and was buried on 9 Jan 1909 in St Andrew's, Aysgarth [D74]. Nonus married Rebecca MASON, daughter of George MASON, on 24 Nov 1858 in Aysgarth. Rebecca was born in 1832/1833. She died on 2 May 1907 in Aysgarth and was buried on 6 May 1907 in St Andrew's, Aysgarth [D74]. Decimus or Daimus DURHAM was christened on 9 Mar 1828 in Aysgarth, Yorkshire, England. Margaret's parents may have been William ROUTH, who was christened on 16 Dec 1762 in Hawes, and his wife Margaret.